"What we've got here is failure to communicate. Some men you just can't reach, so you get what we had here last week which is the way he wants it. Well, he gets it. And I don't like it any more than you men." -- Captain, Road Prison 36, played by actor Strother Martin in "Cool Hand Luke"
FREEDOM INDUSTRIES CAN LEARN FROM ASHLAND OIL – On New Year’s Weekend 1988 Ashland Oil had the largest oil spill in U.S. history at one its facilities in Pittsburgh. For the next 6 weeks every city on the Ohio River from Pittsburgh to Cincinnati and millions of people were impacted as cities had to shut off water systems as the oil spill passed. Wheeling, Parkersburg, Huntington and every city in W. Va. had to shut off water for its residents. The blob was 17 miles long and 18 feet deep. On the first business day after the spill, the president of Ashland not only apologized but accepted complete responsibility. Before the week ended Ashland opened a claim center and gave a $210,000 check to Allegheny County for partial reimbursement. The media, residents and public officials all praised Ashland for its actions in not only apologizing, but accepting responsibility and making amends. The Freedom executives and lawyers should read Chapter 7 from my book and follow Ashland’s example of doing the right thing. If ever a book fills a need in these days of crises to the left of us, crises to right of us, it's Rene A. Henry's "Communicating in a Crisis: A Guide for Management" (Gollywobbler Productions, 326 pages, $34.95). 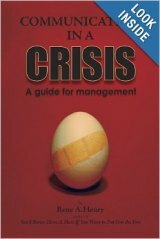 Drawing on more than 50 years experience in public relations -- including corporate relations and crisis management in university settings -- Henry has produced a comprehensive, detailed book that should be on the desk and nightstand of every executive or employee involved in crisis management. Every corporation, law firm or university or nonprofit or government agency should order this book by the caseload, distribute it to employees at all levels and require them to read and digest every chapter. Henry has done his part by making the book very readable and useful with case studies and bullet point checklists. One problem, Henry says, is that all too many corporations, government agencies, universities and nonprofits don't even have a crisis management unit and are in denial that they will ever have a crisis. They rely on untrained employees and -- even worse -- attorneys to pitch in when a crisis develops. While Henry has good things to say about specific lawyers, especially John J. Walsh, he's adamant about keeping legal eagles away from crisis management decisions. "Law schools don't prepare their graduates to enter the legal world knowledgeable about media relations, crisis management or public relations," he writes. "This creates serious problems during crisis situations where an attorney will want to stonewall the media and all public disclosure, while the public relations and crisis communications professional will want immediate and full disclosure." Henry goes on to quote several lawyers on this subject and they're unanimous in their agreement with his conclusions. There are five generic crises and ones specific to a business or industry, Henry says. The five generic ones are terrorism (foreign and eco); acts of Mother Nature, including earthquakes, hurricanes, tornados and floods; sexual harassment and discrimination; violence in the workplace; and environmental pollution. Henry details the specifics of organizing a crisis team and developing a plan in this book, which could serve admirably as a textbook in a one-semester college course in crisis communication -- or as a textbook for a course taught in-house at a corporation, law firm, nonprofit or university. I have no first-hand knowledge of what happened -- only from conflicting reports in the media. The Bayer site manager and spokesman, Nick Cosby, did express remorse for the death of an employee, admitted that something went wrong that caused the explosion, but was faulted by emergency officials for not immediately letting them know what was going on inside the plant immediately after the explosion. This could be a heavy hand with lawyers directing what can and cannot be said. This was obvious by the response of an employee at the main gate identified by Metro 911 as "Steve." In the late 1990s, EPA had a plan in place that required all plants, such as Bayer's, that stored and manufactured toxic and dangerous chemicals, had to have an emergency plan in place in the event of an accidental release. 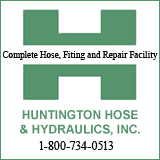 This included an Internet website with a flume overlaid on a map of the surrounding area that could be affected by a hazardous leak, a description of the hazard of the chemical, and emergency numbers to call. This plan was shelved early in the George W. Bush Administration. Federal law requires chemical companies to inform local communities what it is making and storing at plants. I assume this was done by Bayer. If Bayer had a comprehensive crisis communications plan in place, it could have "What if'd" this incident and had a news release pre-prepared and pre-approved by legal that could be released within minutes after the explosion immediately regarding any possible danger of the release of the chemical. The immediate response by West Virginia University State officials in how they directed students to stay inside and turn off air conditioners to prevent air from being sucked in was excellent. Because of a number of disasters, the industry association changed its name from the Chemical Manufacturers Association to the American Chemistry Council. Polls show that as an industry, only Big Tobacco is held in lower regard. Mike Garrison, who lasted only a year as president of West Virginia University, has himself and no one else to blame. It is not that Heather Bresch received a master's degree, but the way Garrison handled the crisis. Many universities give credit to experienced, mature individuals based on their professional accomplishments and this credit allows degrees to be conferred as was the case with Bresch. I do not have all of the details in this case, but understand an independent panel found there was no evidence of Garrison interfering in the process. Garrison had some of the best professional advice available at WVU, but when he took over, he gave new assignments to Christine Martin, the head of university relations and former dean of the journalism school, and Becky Lofstead, who had been heading the news bureau. I believe both could have helped him weather the storm. He also had a number of exceptionally professional alumni available in this field that only needed to be asked. However, university presidents rarely ask for help outside of their institution and especially those who are attorneys. If Garrison had a crisis communications plan in place, he obviously never followed it, nor did the people he had in charge. His general counsel, Alex Macia, the person he made the #1 lawyer at WVU, refused to communicate with me on another story I was writing and you never stonewall a writer. This case exemplifies how very out of touch higher education governing boards are when the WVU board continued its support of Garrison in the face of the faculty senate overwhelmingly voting 77-19 for his resignation. Much could have been done to save embarrassment for the university, its students, the faculty, alumni and friends if he had asked for help from someone experienced in crisis management and communications. Henry covers the gamut of crisis management, with examples from corporations, nonprofits like the U.S. Olympic Committee, the American Red Cross and United Way, and universities. His chapter "The Aggie Pigs and President Bush" draws upon his experience at Texas A&M University in the 1990s, when he tried to advise the university on an extremely controversial agricultural facility next to a long-established black community near the university in College Station, TX. Read it and weep, or laugh, as Henry tries to save the formerly all-male, all-white military academy serious money. He dissects the group-think of academics and finds these well educated people, with their multiple degrees -- surprise! -- are highly immune to common sense. The institutional culture of academia is counterintuitive to dealing with crises. They rely on lawyers all too often -- or (The Horror!) the university presidents are lawyers themselves -- and there is silence, lack of communication, "no comment" (the two worst words you can utter to a journalist) or the media is stonewalled. Speaking from my own reporting experience going back to January 1966, that's the worst thing you can do to journalists. It's the equivalent of waving a red flag to a bull: We'll find out one way or another! Those who believe that sports -- college sports in particular -- are the tail wagging the dog will find plenty of ammunition in Chapter 11: "Foul! Is This Any Way to Play the Game?" With the exception of Joe Paterno at Penn State University, college coaches have a reputation of behaving badly, enabled by the same bonehead university officials who don't understand how to communicate with the news media. Henry cites examples at Texas A&M and West Virginia University. Henry questions, as many have done, why coaches in major university athletic programs are paid at least six times as much as presidents at the same universities. The book is also valuable to journalists. Many news organizations are guilty of stonewalling journalists who come to them for answers and comments when crises erupt. Henry describes in detail a situation he personally was involved with when he attempted to correct an erroneous story about one of his clients that appeared in the prestigious Columbia Journalism Review, published under the auspices of Columbia University in New York City. He tells me that his experience with CJR and Columbia are similar to those of other public relations professionals that he knows, reinforcing the argument about the institutional culture he describes in the book. It's no secret that customer service in the airline industry and the travel and hospitality industry in general has declined to levels that would make a Third World country cringe, rendering the chapter on that topic vital. Henry attributes many of the problems with airlines to the deregulation of the industry 30 years ago, in 1978, in the Carter administration. With the exception of Southwest Airlines, virtually all the airlines rank near the bottom of the heap in terms of customer service and satisfaction, he says. "Communicating in a Crisis" is an important book that serves a vital need during this period of mistrust in virtually all segments of society. I recommend it without reservation. The book is available at Amazon.com or from the publisher. Rene A. Henry, born in Charleston, WV in 1933, lives in Seattle and is the author of six other books in addition to "Communicating In A Crisis."